A ballad is a narrative poem written in a rhythmic verse that may be sung. Ballads tell a story, often one that is dramatic or emotional. Ballads are often written in quatrains that have alternating rhymes and patterns of stressed syllables. Here is an example of a famous ballad. This is about the outlaw Jesse James. No one knows who originally wrote this, because it was passed down as a song for many years before being written down. Since then, many famous singers like Van Morrison have sung variations of this ballad. Try reading this aloud and notice the patterns of rhyme and stressed patterns. 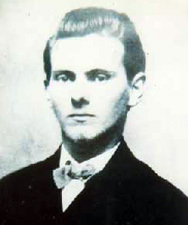 Jesse James was a lad that killed many a man. He'd a hand, a heart, and a brain. And he laid Jesse James in his grave. And they shot Captain Sheets to the ground. They robbed the Danville train. They laid Jesse James in his grave. To take Jesse James alive. 1. Do you like this poem? Why or why not? 2. Why is this poem a ballad? How is it similar or different from the description of the ballad given above? 3. Think of modern songs that you know. Are any of them ballads? What makes them a ballad? An epic poem is generally long and tells a story, often of a hero or a very significant event. Epic poetry is not typically sung. Famous epic poems include Homer’s “The Odyssey” and “Paradise Lost” by John Milton. A lyric poem is generally short and expresses deep personal feelings. Lyric poems may be sung or accompanied by music, but may not. Lyrics often have a refrain or a line or lines that are repeated throughout the poem. Types of lyric poems include elegies, odes, and sonnets. Even haiku is a type of lyric. An elegy is a very sad poem, often expressing sorrow over someone who has died. Elegies are typically written in couplets that have a specific pattern of meter. 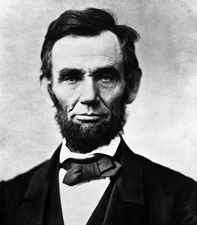 This is a famous elegy written about Abraham Lincoln. 4. Do you like this poem? Why or why not? 5. What makes this poem an elegy? How is it similar or different from the description of an elegy given above? An ode is a lyric poem with a complicated structure that praises a person or marks an important event. Odes are generally meant to be performed with music. Pindar was an ancient Greek who wrote great odes. Some of them were about the Olympic games. More recently Chilean poet Pablo Neruda wrote odes to a variety of topics. The poem below appeared in the book The Adventures of Huckleberry Finn. 6. Do you like this poem? Why or why not? 7. What makes this poem an ode? How is it similar or different from the description of an ode given above? A sonnet is a fixed verse lyric poem that has 14 lines. Sonnets are often about a thought or feeling and have a final line that summarizes the theme. There are different types of sonnets. The English sonnet has three quatrains and a final separately rhymed couplet. The most famous writer of sonnets is Shakespeare, who wrote over 150 sonnets. Modern poets like Robert Frost, Pablo Neruda, and Rainer Maria Rilke have also written sonnets. Here are a few examples of sonnets. 8. Find the quatrain(s) and couplet(s) in these sonnets. Does this match the definition of an English sonnet? 9. What is the single important idea in each of these poems? 10. Which of these poems is your favorite? Why? 11. Which type of poem is likely to be longer? 12. Which of these is not a type of lyric poem? 13. Which type of poem has 14 lines? 14. What unit of poetry has two lines? 15. Which type of poem is often sung? 16. What type of poem expresses sadness over someone who has died? 17. How do rhythm and rhyme affect the way a poem makes you feel? 18. 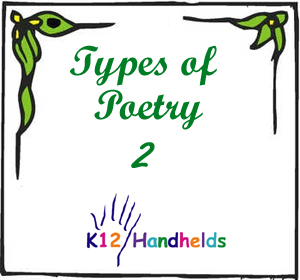 Choose one of the types of poems discussed here and write one of your own.